From the moment Sophocles had Oedipus gouge out his own eyes to The Dark Knight’s Harvey Dent’s persona transforming disfigurement, few injuries are more horrifying than that of facial trauma. While grappling with our initial reactions to these injuries, there are several general points we must keep in mind. Do not be distracted, as always assess for life-threatening injuries first. Cervical spine injury in 10-15% of cases where the patient is unconscious. Carotid or vertebral artery dissection. Particularly true in Le Fort II and III. Airway supplies: Magill forceps, good suction, crichothyroidotomy supplies (5-6 cuffed tracheostomy tube, bougie, scalpel, 12-14 gauge needle). Remember, open crichothyroidotomy is relatively contraindicated in children less than 8-12 (variable recommendations) due to increased risk of subglottic stenosis and vocal cord damage. Needle crichothyroidotomy using a 12-14 gauge needle is preferred as a bridge to tracheostomy. Nasal packing supplies (Beware of intracranial placement). Facial trauma is often associated with domestic violence as well as elder or child abuse. Does your face feel numb anywhere? Do your teeth fit together normally? Complete a thorough examination of the eyes, including bilateral visual acuity, tonometry (if no evidence of ruptured globe), and funduscopy (for traumatic retinal detachment), palpation of the facial bones, and finally examine the oral cavity. It is possible to assess the pupillary response through closed/swollen lids via ultrasound in an unconscious patient or to check light perception through closed lids if the patient is responsive. 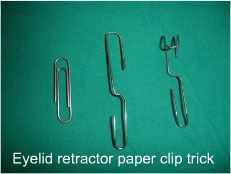 Eyelid retractors can be easily fashioned out of paperclips (see right). Alternatively, check out this method proposed on ALiEM. Teardrop pupil with herniated iris. an result in ocular compartment syndrome with optic nerve ischemia. However, if surgical decompression (lateral canthotomy) is delayed greater than two hours, blindness results. Stat ophthalmology consult with repair within 24 hours. High dose ketamine >5mg/kg IV may increase IOP (Drayna, 2012). Etomidate and Rocuronium do not increase IOP. Don’t take objects out; Don’t measure IOP; Don’t dilate! Elevate the head if you can, sedate, and treat nausea/pain aggressively to lower IOP. Medical treatment as described for retro-orbital hematoma may also help. Requires massive force and is therefore rare. 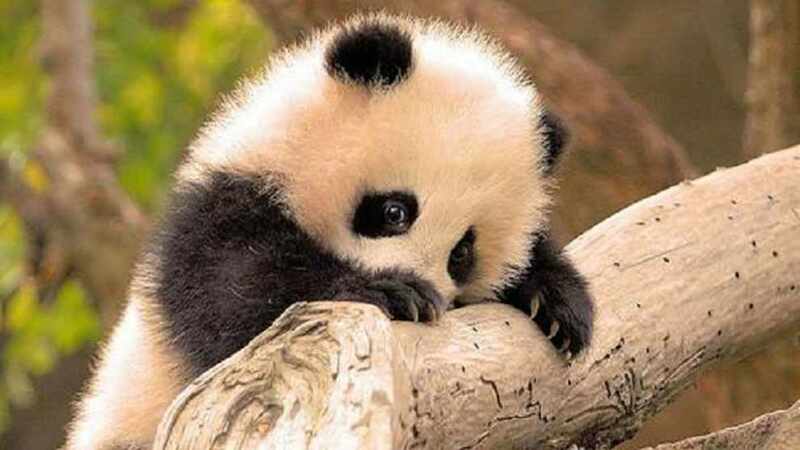 Don’t try to stick the eye back in the socket. Reportedly can result in infarction of the thalamus via damage to arteries that pass through the optic chiasm (Rudelli, 1979). Build up a dressing around the globe. Keep moist with saline and shield. Prognosis is dependent on the degree of damage to the optic nerve. Find missing teeth. If you can’t find them in the mouth, obtain a chest x-ray. Careful palpation will detect most displaced fractures. Panda face, aka bilateral shiners is a red flag for Le Fort fractures. Naso-orbito-ethmoid fractures secondary to concomitant csf leaks. Injuries that cause trismus and therefore compromise the airway. 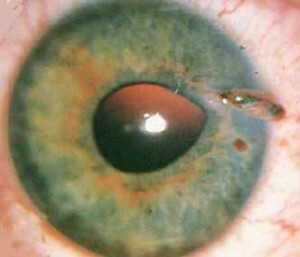 Injuries that result in loss of extra ocular movement, as necrosis of entrapped muscles can occur, particularly in children. Head CT: 90% SN for facial fractures when compared to facial CT (Marinaro, 2007). Waters view is less sensitive and you likely need a head CT anyway. Specific facial CT with reconstructions helpful for significant displaced fractures. Panorex is only 85% sensitive for jaw fracture. Therefore, mandible CT is recommended if the patient is going to undergo head CT.
Often result from fracture of the cribriform plate within the ethmoid bone. This commonly results in loss of smell. Beta-2-transferrin is the definitive test. Caputo, Nicholas D., Andaleeb Raja, Christopher Shields, and Nathan Menke. "Re-Evaluating the Diagnostic Accuracy of the Tongue Blade Test: Still Useful as a Screening Tool for Mandibular Fractures?" The Journal of Emergency Medicine 45.1 (2013): 8-12. Print. Drayna, Patrick C., Cristina Estrada, Wenli Wang, Benjamin R. Saville, and Donald H. Arnold. "Ketamine Sedation Is Not Associated with Clinically Meaningful Elevation of Intraocular Pressure." The American Journal of Emergency Medicine 30.7 (2012): 1215-218. Print. Dula, David J., and William Fales. "The ‘Ring Sign’: Is It a Reliable Indicator for Cerebral Spinal Fluid?" Annals of Emergency Medicine 22.4 (1993): 718-20. Print. Marinaro, Jon, Cameron S. Crandall, and David Doezema. "Computed Tomography of the Head as a Screening Examination for Facial Fractures." The American Journal of Emergency Medicine 25.6 (2007): 616-19. Print. Tintinalli, Judith E., and J. Stephan. Stapczynski. Tintinalli's Emergency Medicine: A Comprehensive Study Guide. New York: McGraw-Hill, 2011. Print. "Exploding Eye Lecture (Video)." OphthoBookcom. Web. 04 Nov. 2014. <http://www.ophthobook.com/videos/exploding-eye-lecture-video>. "Eye Trauma Video." OphthoBookcom. Web. 04 Nov. 2014. <http://www.ophthobook.com/videos/eye-trauma-video>.